Tune in to the following Podcast on the Purple Machine, a not widely known coding machine used by the Japanese to hide covert messages. For keen insight about how the United States was able to turn around the war in the Pacific, missed clues regarding the Pearl Harbor attack, and background behind the Purple Machine, you won’t want to miss this podcast. 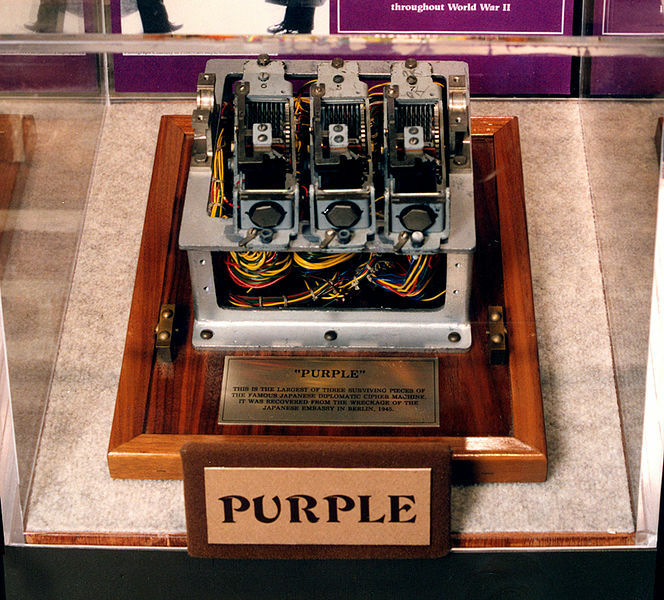 The Purple Machine closely followed the design of the German coding machine, also known as Enigma. The Purple Machine was crucial to the Japanese in keeping messages secret from the Allies in World War II until the coding technique was compromised, and ultimately led to Japan’s demise. Alberto-Perez. "How the U.S. Cracked Japan's 'Purple Encryption Machine' at the Dawn of World War II." Io9. Io9.gizmodo.com, 22 Mar. 2013. Web. Balciunas, Marijus. "Japan's Purple Machine." (n.d.): n. pag. 18 Mar. 2004. Web. Chen, C. Peter. "Hiroshi Oshima." WW2DB. N.p., n.d. Web. Contributor, Quora. "How Did the U.S. Break Japanese Military Codes Before the Battle of Midway?" Slate Magazine. N.p., 20 Nov. 2013. Web. Enigma T - Tirpitz. N.p., n.d. Web. "Japanese Purple Cipher." Cipher Machines. N.p., n.d. Web. Kahn, David. The Codebreakers: The Story of Secret Writing. N.p. : Scribner, n.d. Print. The music/ sound effects were from www.orangefreesounds.com/.